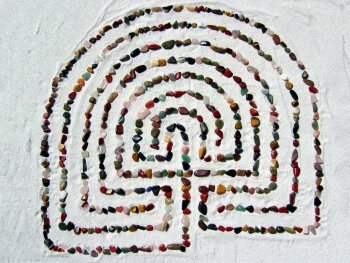 In 2008, a gift by the family of Robert W. Fuller enabled an indoor labyrinth to be installed in Bodwell Hall for use whenever the church is open. 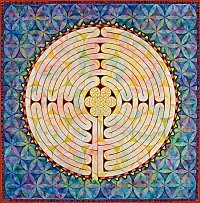 A labyrinth is a metaphor for our spiritual journey through life. A single circuitous path winds in and out in one direction: a circle symbolizing wholeness and unity. A labyrinth is not a maze. Mazes make you lose your way. Labyrinths help you find your way. A maze requires choices. A labyrinth presents only one path, requiring no choices. There are no dead ends, no wrong turns, simply one path to the center and back out. 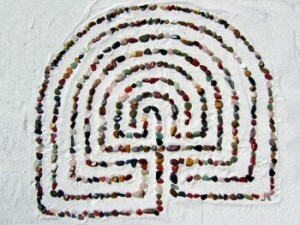 A labyrinth can be a form of pilgrimage. When actual travel is impossible, walking a labyrinth is an easily accessible journey. Despite the shorter time and distance involved, it still provides time and space for listening, praying, meditating. * Journeying In to the center, quieting or emptying yourself, letting go of the details of everyday life, struggling with a life challenge. * Resting in the Center meditating, praying or simply being of open mind and heart to receive whatever gift or insight may be present.